1. 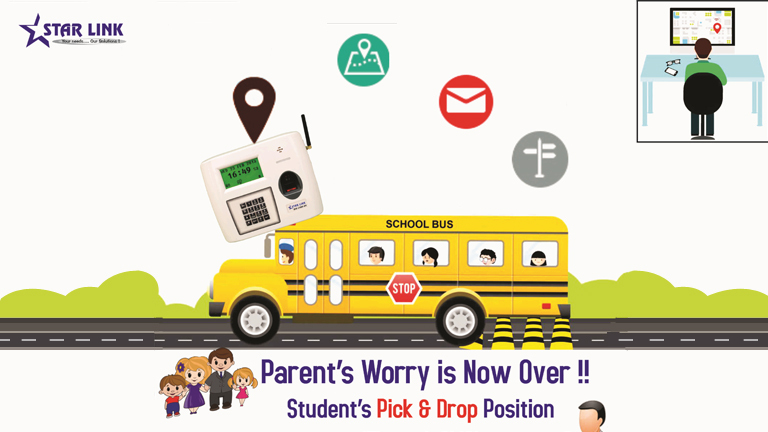 New Delhi based School was having a problem in maintaining the data of the student while ferrying them to their respective pick-up and drop-points. 2. Security was the rising concern among parents and school authority. 3. Previously, Students/Staff were managed manually, and students lied that the bus had not passed their route or it was delayed. 4. Also, there were lots of fake reasons and proxies found in the manual register. In that case, parents and school authority were worried about the fake absence of students from the school. The school authority decided to implement full-proof biometric system in their school vehicle which can keep the track record of every student from their pick up point to drop point with their exact timings and vice-versa. Also, they wanted the location details (latitude and longitude) of every student in the records. They also wanted a software that can generate the reports. Star Link Communication Pvt Ltd implemented a hardware solution and a software to solve their challenges. Star Link offered them a Biometric Device namely Bio Lynx with power back-up adaptor. This device operates on 12V and 24V with GPRS as a connectivity mode and a GPS technology for the real-time location of the student. Also, a web based software was implemented which generates the reports, student wise, location wise, and time wise. Additionally, daily/monthly/weekly reports are generated. According to the challenges faced and requirements, Star Link implemented to install a biometric attendance machine enabled with GPS and GPRS in their every vehicle which was used to ferry students. The Bio Lynx device which was implemented is installed and connected through the server using GPRS and the real-time data is sent to the software. The route of the bus is pre-defined and this is informed to every student on the same route. When any student is picked up by the bus, the student punches onto the machine and his name, location and time are sent to the server. Including this, an SMS is sent to the parents about their pick-up. 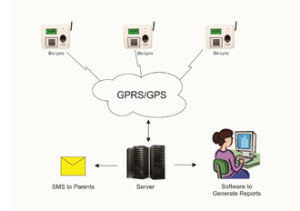 The same process is repeated when students drop down to their destination; name, location and time are sent to the server and SMS is sent to their parents. Our software can be accessed by the person who is given permission by the school authority. The web-based software allows the user to access the software from any internet enabled device from any part of the world. He/She can also generate reports as per the requirement, whenever they want to check the location details of the students. Our software is a comprehensive software with advanced features like daily/weekly/monthly reports, student wise, location wise, time wise, class wise and many other reports with extensive filter options. This eliminates the complexity of manual system which was active earlier. Since, Star Link is a manufacturer of Solutions and the software and hardware implemented is developed in-house. So, we can do any kind of customization possible depending on the requirement of the clients, which can further simplify and ease their challenges faced. 1. Students need to do the registration and enrollment of their fingerprints with other details. 3. Now students can mark their presence while getting in and out of the bus they ferry for school. 4. Staff members can also use the same procedure. 5. Real-time detail of the student is seen by the reports generated through the software. 6. Real-time SMS with every information sent to the respective parents of the students. 7. In the whole system, there is a provision to allow or not allow the students for a particular event. 5. No fake reasons for absence from school.